← Your Tickets Won’t Go Away, but your Penalties for Nonpayment Might! Every year, we know this day will come; but we are never really prepared for it. So far this autumn, we’ve gotten our fair share of sun and comfortable temperatures, so we’re not complaining. But alas, the soothsayer Tom Skilling says snow starts Saturday or Sunday. You read that right; winter is coming. While the snowfall will bring joy to some and draw the ire of others, it also means that there are a few laws and city ordinances that you will want to keep in mind this winter. Stay tuned to LauraLaw’s blog throughout the winter to keep apprised of changes in those laws, but we start today with Chicago’s recently-updated snow removal ordinance. In Chicago, you must shovel your sidewalks. Whether you’re a business owner or a resident, it is your duty to remove snow and ice from the public sidewalk in front of your building. Although historically the city rarely cites those who don’t properly shovel, the city’s current financial woes may change that. 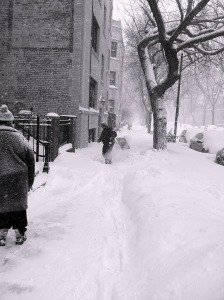 Pursuant to the budget that was passed by Chicago’s City Council on November 2, 2015, the fine for failing to keep your sidewalk clear of snow can result in a fine of anywhere from $50 to $500 for a resident, and up to $1,000 for a business – PER DAY OF UNSHOVELED SNOW. So, if it snows between 7:00 a.m. and 7:00 p.m., you must be shoveled by 10:00 p.m. that night; but if it snows overnight, from 7:00 p.m. to 7:00 a.m., you need to shovel by 10:00 a.m. that morning. To keep up to date on the latest snow events in Chicago, the city has set up a few good sources of information: Chicago Shovels, as the program is known, has links to some helpful winter apps that will keep you updated about overnight parking restrictions and locating towed vehicles, and a plow tracker to help you keep apprised of the location of the city’s many snow plows. The city has also set up a program called Snow Corps that links willing and able volunteer shovelers with residents that, for whatever reason, can’t do their own shoveling. In the coming weeks, we will update you on some other laws, and just like last year, we will let you know when the overnight parking ban goes into effect. In the meantime, stay tuned to LauraLaw for other updates and interesting legal developments; and if you are fined by the City of Chicago, or any other city in Cook County, for failing to shovel your sidewalk or for any other alleged violation, don’t pay your ticket without contacting us first. One of our skilled attorneys will be happy to help you determine if we can lower those fines or avoid payment altogether. Happy shoveling!